World Cup soccer in Toronto is going to be huge this summer. The tournament kicks off Thursday afternoon at 4:00pm with hosts Brazil playing Croatia at the Arena Corinthians in Sao Paolo. Over the next month, 32 countries will battle it out for the ultimate sporting prize: a chance to hoist the famous green and gold trophy and the all-important right to be insufferable for the next four years. Even casual soccer fans will find something to like this year. Brazil is just an hour ahead of Toronto, so kick off times are bar and patio friendly–no midnight wake-up calls or 5:00am starts. If you’re wondering what happened to Canada, the team finished third in their North, Central America, and Caribbean qualifying group behind the mighty Honduras and Panama, therefore failing to proceed to the next round. But, don’t fret. Who needs Canada when there are so many other great countries to support. 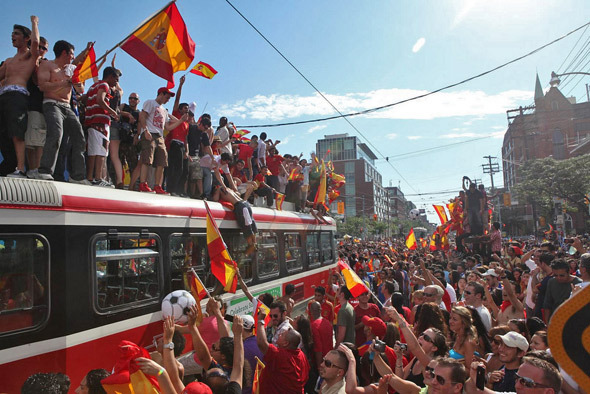 Here is our guide to watching the 2014 World Cup in Toronto. If partisan crowds aren’t your thing, there is a dizzying selection of quality places to catch a game this summer in Toronto. The Queen and Beaver, though listed here as a place for England fans to cheer on their team, is also a good neutral option. Likewise, Cafe Diplomatico on College might be famous for its Italian affiliation, but the bar will be showing all games this tournament and is a good option for fans of European teams throughout the tournament. As the name implies, the Football Factory at Queen and Bathurst is also a solid bet. The place will be overflowing with clamouring football-sorry, soccer-fans so arrive early and grab a spot on the patio. On Roncesvalles, local stalwart The Dizzy will be packed with delirious fans. Midtown soccer fans will want to hit up Scallywag’s, which always sports a rabid fan base (expect English and Brazilian fans). Also see our list of the best sports bars in Toronto. On Adelaide St. W., Copacabana Brazilian Steakhouse is hosting a slew of several World Cup viewing parties. The venue is promising to remain neutral, but there’s a good chance it will lean Brazilian as the tournament goes on. Games will be shown on LED TVs on the open-air third floor and there will be drink promotions and other entertainment. During the third place consolation game and the World Cup final, CIBC, the CBC, and Budweiser are teaming up for a Brazilian-themed festival at Front and John streets. On Saturday, bands Alysha Barilla, Jordan John, and Shad will perform with a Brazilian band. Sunday sees the broadcast of the final and a concert from featuring Maestro. Drink in the Budweiser beer garden, yell in CIBC’s “cheer booth,” and take part in Adidas giveaways. In Newmarket, Upper Canada Mall will be showing all of the games that fall within shopping hours on large flat screen TVs surrounded by lounge seating. Not exactly public, but if you want to watch the game outside in the sun on a huge screen, Cabana Pool Bar will be screening games on a 21ft LED screen. They also plan to host a Brazilian beach party on Saturday, June 21. The Duke of Gloucester – 649 Yonge St.
Queen and Beaver – 35 Elm St. The Dog and Bear – 1001 Queen St. The Duke of Kent – 2315 Yonge St. The Bristol – 1087 Queen St. W.
Queen Victoria Pub – 2240 Midland Rd. Cafe Diplomatico – 594 College St.
Bar Italia – 582 College St.
Nino D’Aversa Bakery – 1 Toro Rd. Bairrada Churrasqueira – 1000 College St. Lifetime Sports Bar – 818 College St.
Bigodes Sports Cafe – 209 Geary Ave.
Brazilian Star – 1242 Dundas St. W.
Rio 40 – 1256 St. Clair Ave. W.
Lula Lounge – 1585 Dundas St. W.
Copacabana Steakhouse – 150 Eglinton Ave.
Betty’s – 24 King St. E.
School Bakery Café – 70 Fraser Ave.
Café Frappe – 519 Danforth Ave. The Fox and Fiddle – 535 Danforth Ave. The Rushton – 740 St. Clair Ave. W.
The Fox’s Den – 1075 Bay St. The Musket – 40 Advance Rd. El Rincon – 653 St Clair Ave. W.
Milagro – 5 Mercer St.
Sports Centre Café – 49 St. Clair Ave. W.
Tranzac Club – 292 Brunswick Ave.
Yauca’s Lounge – 755 Dovercourt Rd. Fox and the Fiddle – 280 Bloor St. W.
La Rosa Chilena – 760 Wilson Ave. The Harlem Underground – 745 Queen St. W.
Football Factory – 164 Bathurst St.
El Rancho – 430 College St.
El-Tipico Ecuatoriano – 2312 Keele St.
Latin Fiesta – 1002 St. Clair W.
St. Tropez – 315 King St. W.
Sky Ranch Restaurant – 2473 Dufferin St.
Rakia Bar – 1402 Queen St. E.
Banu – 777 Queen St. W.
The Suya Spot – 12 Bradstock Rd. Panafest Sports Bar – 2708 Jane St. The Office Pub – 117 John St.
Café Casablanca – 1393 Danforth Ave. The Football Factory – 164 Bathurst St.
South Korean Canadian Cultural Association – 1133 Leslie St. Troika Vodka Boutique – 95 King St. E.
Hemingways – 142 Cumberland St.
Real Sports Bar – 15 York St.
Rally Sports Bar – 1660 O’Connor Dr. The Loose Moose – 146 Front St.